Slavery, Not States' Rights, Caused Civil War Whose Political Effects Linger : It's All Politics Slavery was the Civil War's cause despite revisionists saying otherwise. Historian Adam Goodheart, who has a new book on the critical year of "1861" said he thinks part of the reason for that revisionism is the difficulty some Southerners have in believing their ancestors fought for slavery. 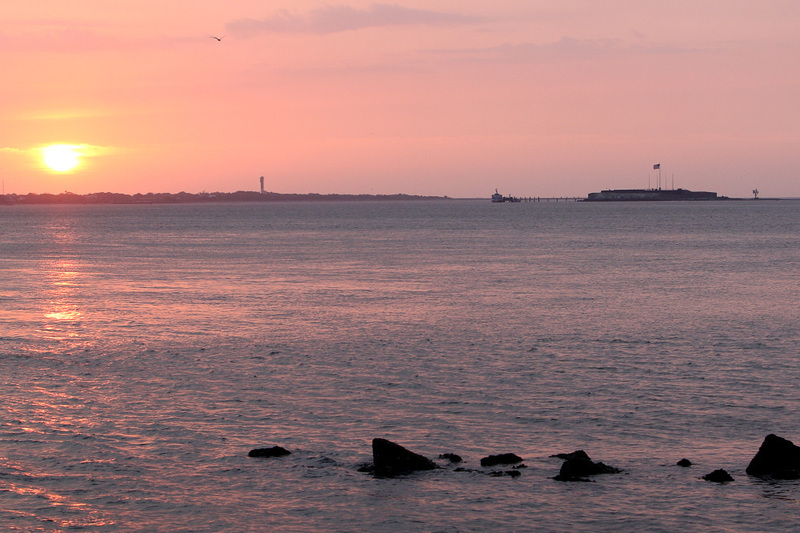 Fort Sumter in Charleston, S.C., where the first shots of the Civil War were fired. It's the 150th anniversary of the start of the Civil War when Southerners fired on the union redoubt of Ft. Sumter in Charleston, SC's harbor. If one of William Faulkner's most famous lines ever applied to anything — "The past is never dead. It's not even past." — it is the Civil War. All this time later, that war still echoes powerfully through American politics. You could draw a straight line from that war through Reconstruction to Jim Crow segregation to the Civil Rights era, then affirmative action and on to the election of the first African-American president up to the present moment. They are all linked. And they have left their mark on the two major political parties, with African Americans exiting the party of Lincoln and white Southerners embracing it as the lingering shock waves from the Civil War eventually led the parties to reconstitute themselves in different ways. Americans even still debate why the war was fought. Many a revisionist says it was about state's rights. Others insist it was over slavery. The latter have history on their side. Jefferson in his forecast, had anticipated this, as the "rock upon which the old Union would split." He was right. What was conjecture with him, is now a realized fact. But whether he fully comprehended the great truth upon which that rock stood and stands, may be doubted. The prevailing ideas entertained by him and most of the leading statesmen at the time of the formation of the old constitution, were that the enslavement of the African was in violation of the laws of nature; that it was wrong in principle, socially, morally, and politically. It was an evil they knew not well how to deal with, but the general opinion of the men of that day was that, somehow or other in the order of Providence, the institution would be evanescent and pass away. This idea, though not incorporated in the constitution, was the prevailing idea at that time. The constitution, it is true, secured every essential guarantee to the institution while it should last, and hence no argument can be justly urged against the constitutional guarantees thus secured, because of the common sentiment of the day. Those ideas, however, were fundamentally wrong. They rested upon the assumption of the equality of races. This was an error. It was a sandy foundation, and the government built upon it fell when the "storm came and the wind blew." Terry Gross, host of Fresh Air which is produced by NPR member station WHYY, talked with historian Adam Goodheart whose new book "1861" examines that critical year in American history. She asked Goodheart why there was still this debate over whether slavery or states' rights caused the Civil War. She also mentioned how Virginia Gov. Rob McDonnell caused a stir last year when he issued a proclamation of for Confederacy History Month without mentioning slavery and how Mississippi Gov. Haley Barbour more recently said that slavery was the cause of slavery. When you go back and you look at the actual documents, many people have said since then that it was about states' rights, but really the only significant state right that people were arguing about in 1860 was the right to own what was known as slave property — property and slaves unimpeded — and to be able to travel with that property anywhere that you wanted to. So it's clear that this was really about slavery in almost every significant way, but we've sort of pushed that to the side because of course we want to believe that our country is a country that's always stood for freedom. And ... certainly it's difficult for some Southern Americans to accept that their ancestors fought a war on behalf of slavery. And I think that Northerners really, for the cause of national reconciliation, decided to push that aside — decided to accept Southerners' denials or demurrals." As Terry also noted, some of the language associated with the perspective some Southerners have of the Civil War's causes, states' rights and nullification in particular, have worked their way into the health-care debate. More evidence, perhaps, that the past is not even past.